What food do we need? Homeless? Struggling? Why does someone need a food parcel? On Monday 17 September 2018. 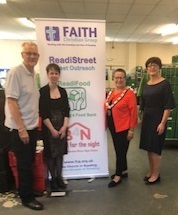 FAITH staff Malcolm, Alison, Amanda and volunteer John welcomed The Mayor of Reading, Councillor Debs Edwards to the warehouse at Boulton Road, Whitley. Staff shared working experiences of the support, help and friendship FAITH minister through their outreaches in Greater Reading. Conversations included ReadiFood and the many valuable volunteers that support this service in Greater Reading. We also talked about our street outreach ReadiStreet which runs at The Minster 5 days a week. We shared stories of the past four years that the B4N Night Shelter, along with the Churches in Reading have worked with St. Mungo’s and have given support during the winter months. 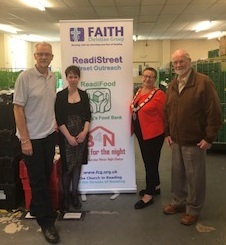 Councillor Edwards is aware of the work that FAITH carries out through her own charitable work in Reading and is interested in furthering and supporting our work within Greater Reading.